I really wanted to find an "out of the box" use for the "Sitting Here" stamp set. When I turned the bench swing upside down I could see bunting for the 4th of July! 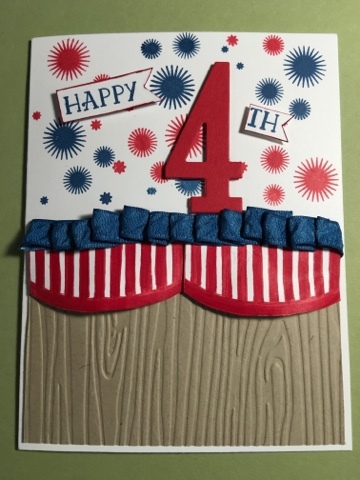 So I had to get busy and see how my epiphany would work of bunting hanging over a fence with fireworks. I'm very happy with the bunting effect and the fireworks. I'm not loving my fence but it was late and I was running out of steam. What do you use to create a fencing look on a card?